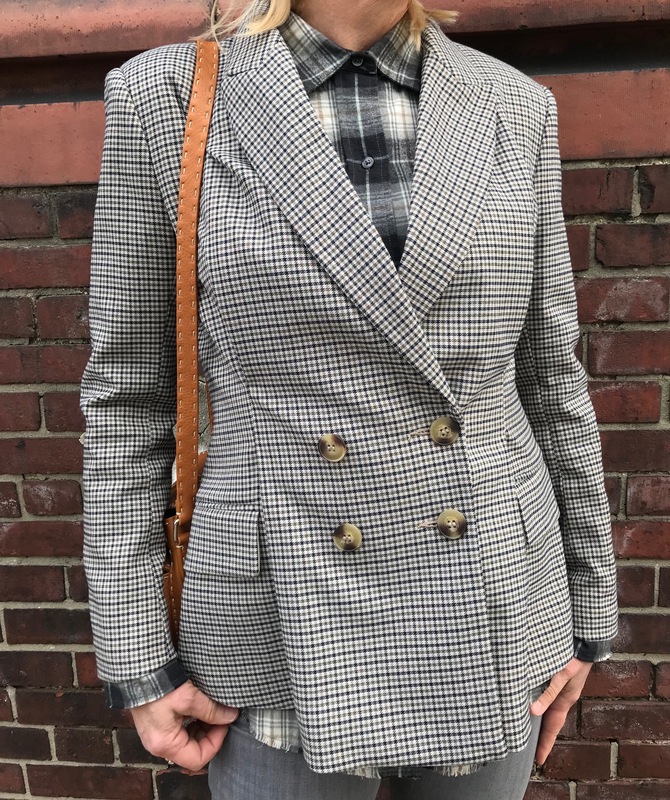 Confession…I have been thinking about going for this look (cause it’s seriously plaid on plaid on plaid is) but put it off for now very fuzzy reasons. 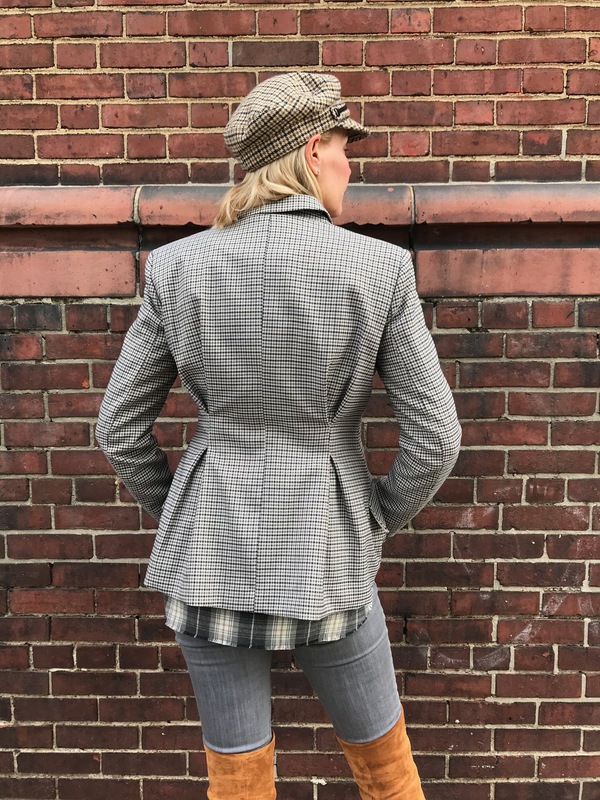 I do have to admit that the newsboy cap was a last minute add due to a “bad hair day,” but this jacket, flannel shirt and OTK boots have been calling to me. “Wear me, wear me…” they whispered from my closet. And so, I did. Why does plaid on plaid on plaid work? Well, I kept everything in the same palette. A mix of neutral tan, grey and black. I love how the plaids are different in size. And a twist on proportion helps. I decided to let the shirt’s frayed hem peek out from the jacket for a more layered, less studied look. But this jacket! Such a find at H & M. I mean between the silhouette, the details, it looks like a million bucks. But thankfully cost under $70. For me, this jacket is the perfect example of designer inspiration (think Burberry, Stella McCartney) meets real life budget. So it is the “hero” piece of this look. And many more to come. The frayed edge flannel shirt (love that subtle touch!) and grey skinny jeans are both Nordstrom Rack finds. I actually saw the shirt for full price in a Meatpacking District boutique but just could not justify the price tag. However…once I spied it at NR it was mine! Thank you, Closet God! The jeans are great for tucking into boots now but will also look super with a white shirt or tee and silver sandals once Summer comes. Let’s talk about these OTK boots. 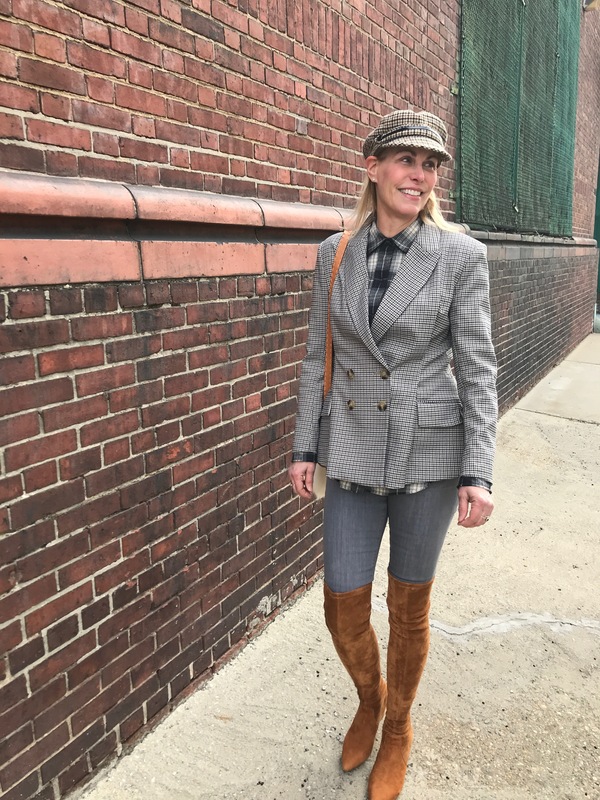 I have been a diehard Stuart Weitzman fan and have avoided pretty much several other more affordable options, mostly because they just did not feel comfy out of the gate like SW boots do. But these? Seriously, I was dubious but, wow, are these boots not just glove-like in feel, they are GORGEOUS. The heel height is perfect. Flattering yet walkable. And they are faux suede, so Vegans rejoice! Last but not least this timeless whipstitched bag is a perfect example of why shopping consignment is a win win. 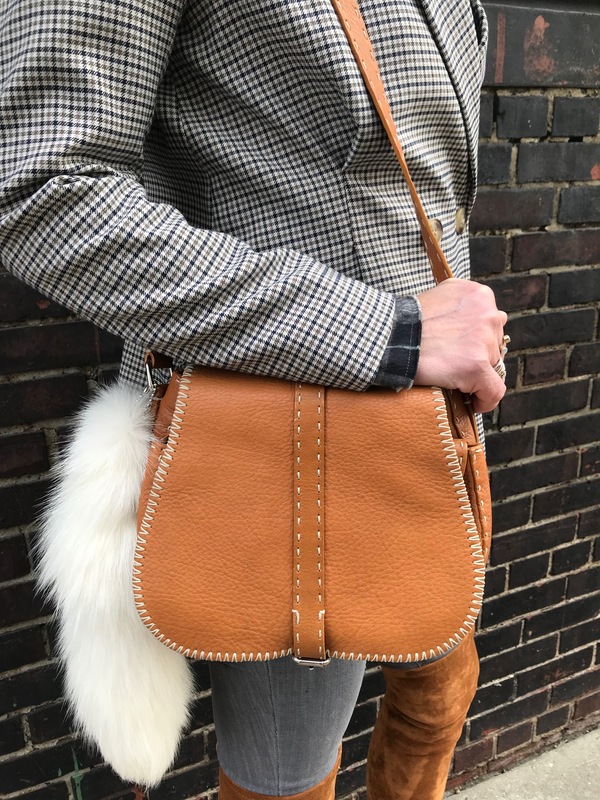 It’s a Fendi and probably cost 5 X what I paid for it…and it looks new! Love that!! BTW, Refinery 29 has declared “tan” bags the IT designer bags to splurge on because they are so timeless. I’d have to agree. And this cap? Another cute sale find…from a few years ago. 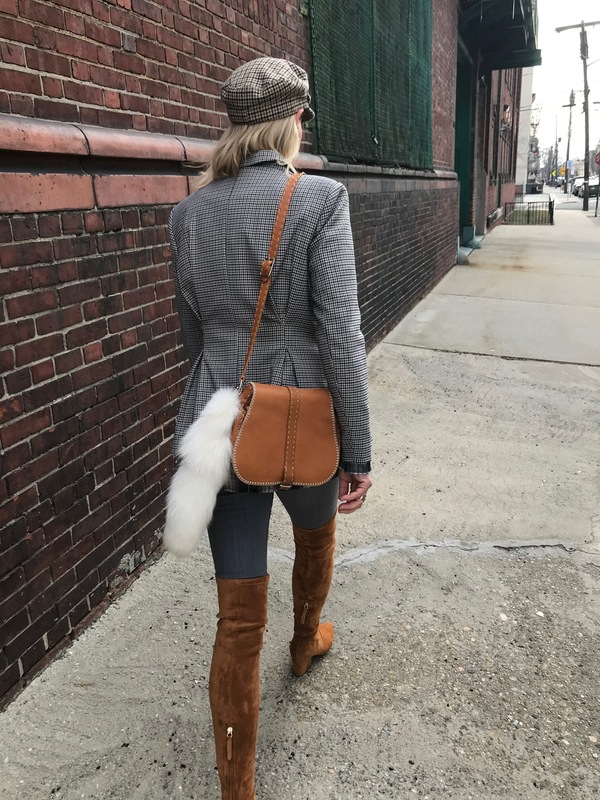 Almost forget the furry white fox tail I added to my bag! It’s an Adirondack find (yes hunting and skinning and taxidermy are a way of life up in North Country). Who said city couldn’t met country? How about you? Are you mad for plaid? Let me know!